Holder Favors Pot Banking, And Legal Dealers Shrug : The Two-Way The attorney general's view could make it easier for marijuana businesses to have bank accounts. But shop owners say they never doubted that banks want a cut of a billion-dollar industry. 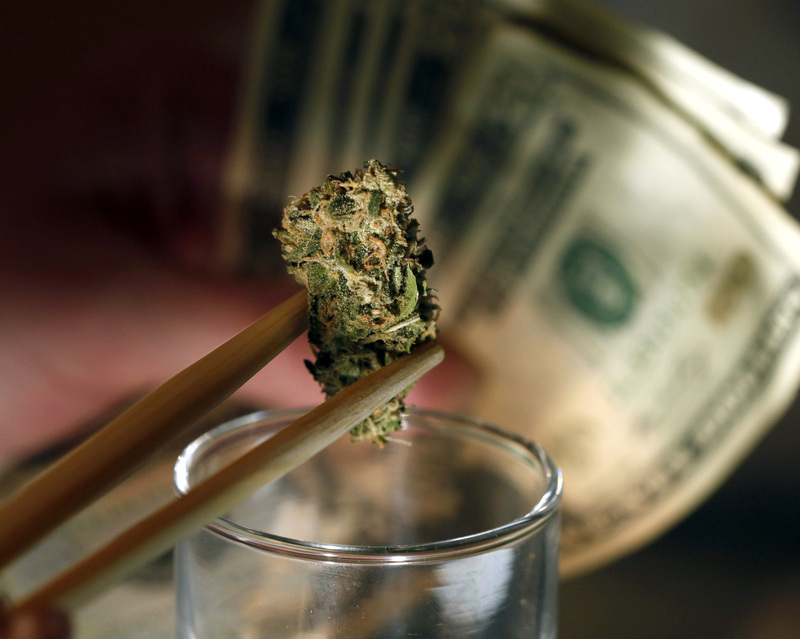 A marijuana bud and cash at a shop in Denver. An owner of marijuana stores in the city says of his company's bank account, "We treat it like gold." When I heard late Thursday that Attorney General Eric Holder had come out in favor of bank accounts for state-sanctioned pot businesses, I assumed the industry would react with cheers. After all, they've long complained about being black-balled by banks, which are justifiably afraid of violating federal laws against handling drug money. But when I started calling around today, the reactions ranged from "That's nice" to "Meh." "We've always had a bank account," says Justin Jones, a part-owner of Dank Colorado, which operates medical marijuana and recreational marijuana stores in Denver. While he's glad to hear Holder supports pot banking, he says the notion that pot stores have been forced to go cash-only is an exaggeration. "Most people in the industry have some sort of bank account," he says. "Whether they're letting the bank know exactly what's going on, or whether they have an umbrella account that works over multiple businesses or a payroll account." In his stores, for instance, you can buy pot with a debit card. "We still stress out about losing our bank account," he says. "We treat it like gold." In Washington state, recreational stores haven't opened yet. Danielle Rosselison is planning a legal pot farm in Bellingham, and she's in the middle of the state's rigorous permitting process. She already has a bank lined up. And while many banks are skittish, she says she never really doubted someone would take her business. "It's a multibillion-dollar industry, and there's no way the banks aren't going to get a piece of this," she says. Rosselison points out that Bank of America has agreed to accept the deposit of pot taxes by the state of Washington. "I'm sure [banks] will do a cost-benefit analysis as to what the Feds say versus how much money can come in," she says. And really, this whole industry is based on a similar cost-benefit analysis: after all, marijuana remains illegal under Federal law. Yes, the Justice Department said in August that it would refrain from prosecuting the state-licensed pot industries. But that could change. All it might take is one presidential election. As Rosselison invests her time and money into her new business, she is gambling that won't happen, and she's convinced banks are willing to make the same bet.